Your personal stylist will select items just for you based on your profile. Want a new dress for an upcoming vacation? Going back to work and need some office attire? Let your stylist know! You'll love the surprise that comes knocking every month. The ease that comes with shopping and trying on in the comfort of your own home is addictive. And who doesn't love mail that isn't a bill? With three boxes to choose from with a range of prices, we are proud to dress women with any budget. Frock Box offers return and exchange options as well as no commitment! You can swap products, skip or cancel at anytime. Beauty comes from within, we all know that. And luckily, we have the most beautiful subscribers. There's nothing like the feeling you get when you put something on that fits just right. Let us help you define your style! Three Boxes to suit your needs, closet, and budget. Whether you're looking for unique & affordable pieces that you can say 'yay or nay' to (Favourites), help with on-trend outfits with wardrobe basics (Gold), or you want to build your accessory collection with Canadian-made Jewelry (Jewel), we have something for everyone. Every box is available in Size 0 - 3XL. No commitments - switch product, skip or cancel at anytime. 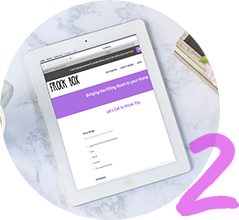 Your Frock Box will be sent monthly and you'll always receive it within 10 business days of sign up or renewal. Sit back and clear some room in your closet! 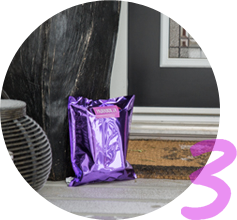 Patiently wait for your pretty package to arrive at your door. Who doesn't love surprises? Frock Box Gold - One on-trend outfit which may include 1-2 clothing pieces and an accessory (if selected in your profile). 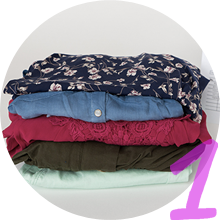 Frock Box Favourites - 5 individually priced clothing pieces selected by your stylist. Try it all on at home; put the rest in your bag with prepaid shipping label and pop in the mail. You're charged only for what you keep! I loved this Frock Box. All the pieces were such good quality and all very unique. The colours, the fabrics, the styles - gorgeous! You've made this stay-at-home Mama, very happy. Got my first frockbox.ca in the mail today. Can't wait to see what comes next month.